Whatever your situation our courses will help you feel in control out of your comfort zone. We Won't Pass On Your Details. A big thank you for the course yesterday. It made me realise that whilst I may be terrified to be in certain situations, as many people do, I am more than capable of dealing with them in a manner that comes across confidently and assured. I am holding my head high with a smile on my face today. When and where are your courses held? We have venues in London, Bristol and Birmingham. Our Assertiveness Courses are held monthly in London and our Confidence courses are held regularly across all our venues. You can find courses dates and venue information on specific course pages. What's the difference between your courses? Firstly, it's helpful to know that both our Self-Confidence and Assertiveness at Work courses cover the 4 key elements of confidence. On the Building Self-Confidence Course, as well as discovering how to come across confidently, you’ll spend time on maintaining a positive mind-set and dealing with any setbacks you may have had. This course is particularly useful for people who have low self-esteem or consider themselves shy. The Assertiveness at Work Course is designed specifically for people who feel a lack of confidence is stopping them moving forward at work. It’s perfect for people who struggle to get their message across as well as those who want to deal with challenging people assertively. Do you offer on-line training too? Yes we do! We offer a unique on-line confidence course which covers everything in the 4 Step Confidence Plan. The course is guided and made up from engaging videos, personality tests and exercises. If you’re unable to attend a one day course, it’s a great place to start. We've made booking a course really easy. Once you’ve chosen your course, you'll need to complete a simple on-line booking form. You'll then receive an invoice and course confirmation. If you are booking a course privately, we ask that payment is made by credit card at the time of booking. For companies; we accept payments by BACS or credit card. Do you offer 'in-house' training? Yes we do. 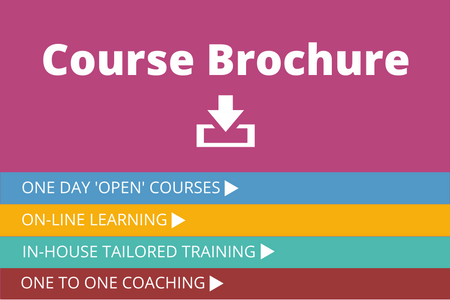 If you have a group of 4 or more people it's cost effective to run an 'in-house' course. We can tailor a course to focus on your organisation's specific needs.